This is a major concern for the fire rescue athlete. On one hand we know we should be working out to stay and get fit for duty. Yet , if we burn out in the gym we won’t be able to perform when it really matters. I recently post workout options and get a lot of emails to post more. But, before I do, I think its really important to keep the big “fitness” picture in mind and see how all these workouts should be organized. Here is my take on the question. We all know that when the bell (or pager) goes off the fire rescue athlete MUST be ready to perform. With that in mind, it doesn’t make a lot of sense to perform a grueling workout while on duty. With that in mind, firefighters must plan their workouts and recovery. These two factors are critical to making fitness progress and staying fit for duty. I personally, prefer some lighter cardio interval training, some core and/or rehab exercises, foam rolling, and stretching on duty and more intense workouts on off days. To insure that your are optimally planning your fitness, I suggest that you take some time each week to plan your workout. Here is a great example of a “planned” week of workouts for the fire rescue athlete. Firehouse Shift- Cardio Interval Crew Workout and foam rolling (click here to check out a great crew interval workout). Full-body Strength or Metabolic Workout. Currently I am following the FRF Ultimate Fire Athlete Workout and would do one of the strength workouts from the program. This type of workout challenges all muscle groups including the core. You could also do a more metabolic workout (like the FRF Fat Loss) has short intervals and more power movements, or use a TRX for you workout (GET FRF Workout). Firehouse Shift- Steady state cardio on the bike or a jog on the treadmill. Also incorporate some foam rolling and light stretching between calls (click here for foam rolling basics). Full-body Strength or Metabolic Workout. I would perform another workout from my program. The workotus include all the needed components that help improve performance: active warm-up, core, functional strength and power, intervals and recovery. Firehouse Shift- Recovery day, maybe some yoga with foam rolling and/or stretching. Intervals or a 5K- Depending on how I feel after the previous shift I would either do a 24 minute interval (6-minute warm-up) or go and run a 5K. I am training for some “fun runs” this summer so this is a great day to fit in some “event” training. I would end either workout with a light stretch. Full-body Strength or Metabolic Workout (like the FRF 300, click here for it)– Same as above. This type of workout challenges all muscle groups including the core. Metabolic workout has short intervals and more power movements, strength workouts utilize longer rest intervals and heavier resistances. 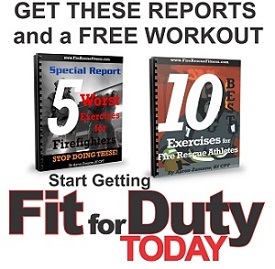 If you are currently spinning your wheels about your workout plan or are looking for a new plan, try the Fire Rescue Fitness Ultimate Fire Rescue Athletes, thousands of firefighters around the country are getting “Fit for Duty” with this revolutionary Fitness Workout Program.